A new SOHC cylinder head makes for a more compact design, while being 15 mm lower and 500 g lighter. As a result, the camshaft is now closer to the centre of gravity, significantly improving handling while shorter valve timing improves bottom end performance and responsiveness from the 63 hp powerplant. A new lightweight 5-speed gearbox produced by PANKL Racing Systems ensures the highest level of durability and reliability. The gear lever also features a unique design that prevents dirt build-up and keeps the lever tip in its original position, even in the toughest conditions, while an advanced gear sensor selects the ideal engine map for each gear. 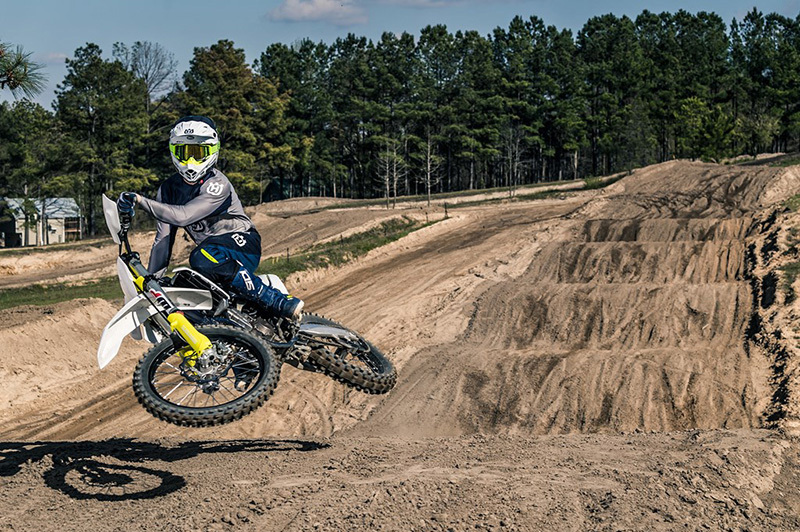 Hydroformed, laser cut and robot-welded, the frames featured in Husqvarna Motorcycles are expertly engineered with calculated parameters of flex. As such, the frame features an increase in longitudinal rigidity resulting in improved rider feedback, energy absorption and straight-line stability. Additionally, the 4-stroke frame now features new brackets for mounting the skid plate available in the accessories catalogue. 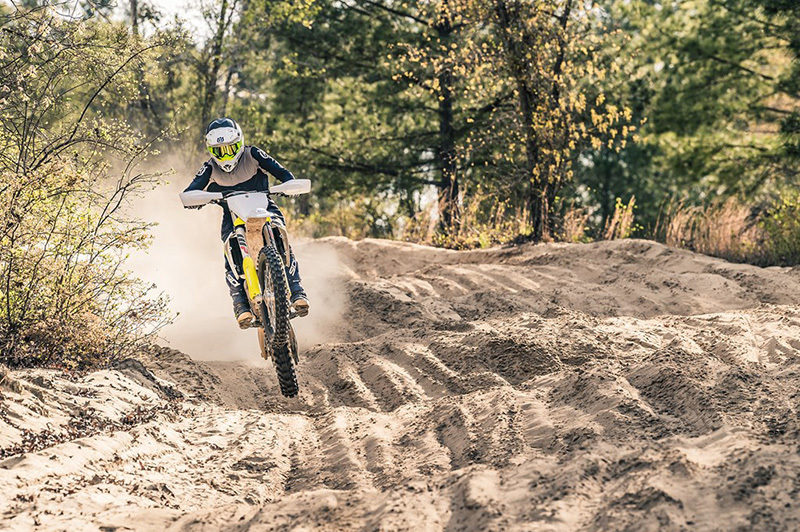 The inertia produced by the crankshaft has been carefully calculated to deliver optimal traction and ride-ability from the powerful 450cc plant. Perfectly positioned, the component harnesses the rotating mass at the ideal center of gravity resulting in a lightweight and agile handling feel. A plain big end bearing comprising of two force-fitted bearing shells ensure maximum reliability and durability, guaranteeing long service intervals of 100 hours. The black-anodized CNC machined triple clamps feature a rubber damping system that reduces vibration, increasing comfort. Additionally, the triple clamps have been meticulously designed to evenly distribute the clamping force on the fork leg, maximizing contact area for optimal sensitivity and minimum friction. The high quality German-made Magura clutch system guarantees even wear, almost maintenance-free operation and perfect modulation in every condition. This means that play is constantly compensated so that the pressure point and function of the clutch remain identical in cold or hot conditions, as well as over time. The FC 450 features a Dampened Diaphragm Steel clutch, which includes a single-diaphragm steel pressure plate instead of traditional coil springs. It integrates a damping system for better traction and durability. The clutch basket is a single-piece CNC-machined steel component that allows the use of thin steel liners and contributes to the compact design of the engine. 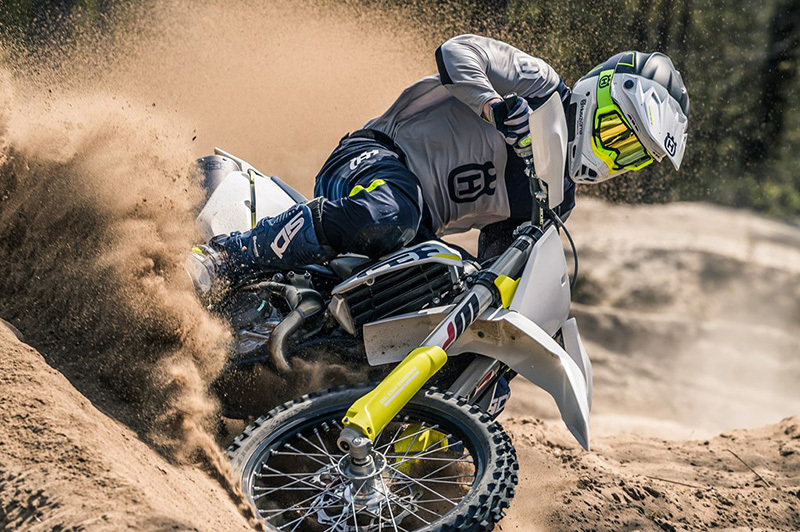 New for 2019, the bodywork on the MX range showcase Husqvarna Motorcycles pioneering Swedish design. 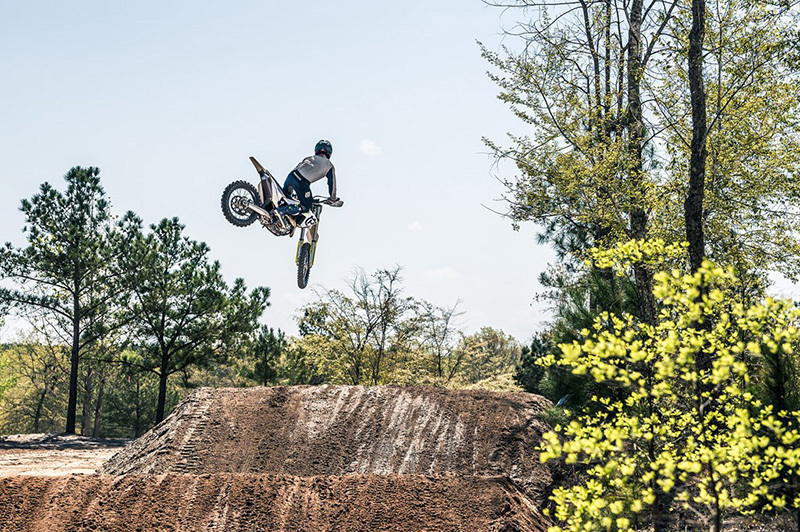 The ergonomics have also been tailored to deliver greater comfort and control, enabling riders to perform at the highest level for extended periods of time. After numerous tests, the contact points have also been slimmed down for seamless movement between riding positions. The WP AER 48 fork is lightweight and easy to adjust thanks to easy access compression and rebound clickers, and a single air valve and supplied fork pump for pre-load. 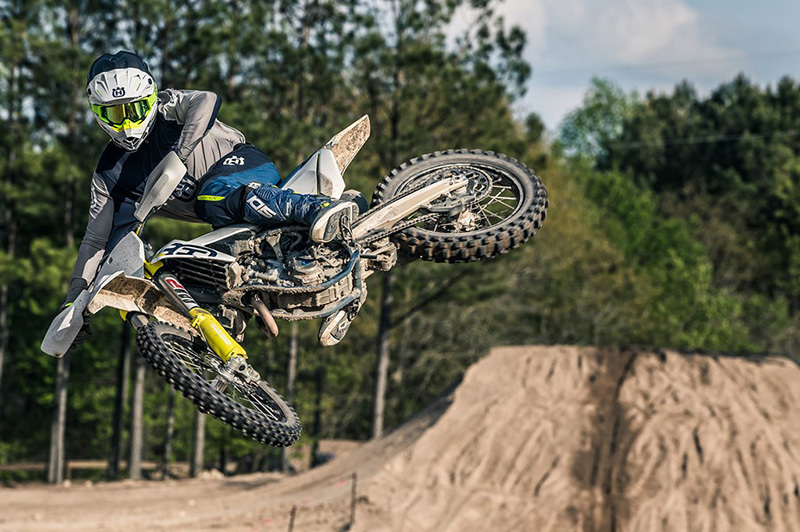 Together with the fully adjustable WP DCC rear shock, Husqvarna Motorcycles offer superior suspension performance, feeling and comfort. The highest level of quality is guaranteed with class-leading Brembo callipers and controls. The 260 mm front and 220 mm solid rear discs deliver superior stopping power instilling confidence in any condition. selectable engine maps via the switch on the handlebar as well as traction control. 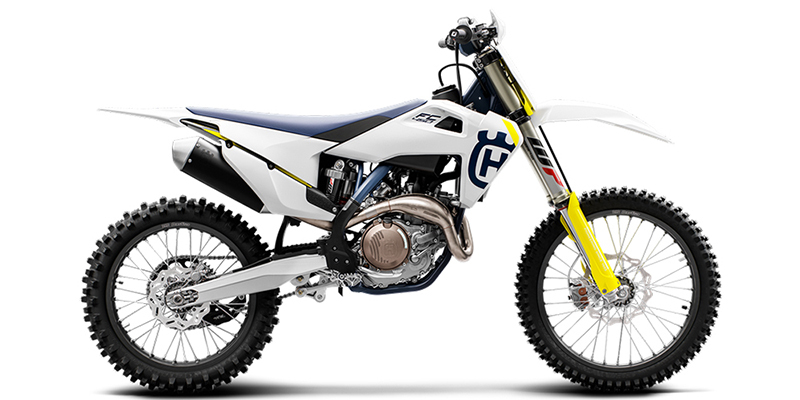 The FC 450, like the rest of the 4-stroke motocross range, features a 44 mm KEIHIN throttle body and injector system that ensures optimal throttle response. Throttle response is also improved thanks to a more direct mounting forgoing a throttle linkage. This has allowed for new throttle cable routing, which makes for easier maintenance and less wear and tear. A new generation Li-Ion 2.0 Ah battery has been fitted to the FC 450, weighting 1 kg less than a conventional lead battery. This adds additional weight saving to the overall bike weight. Additionally, the electric start makes for quicker restarts in the event of engine stalling.